Polar artists brought this Inuit doll into our home. 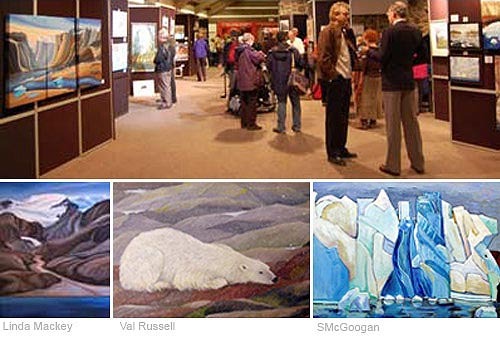 In November I went to an exhibition and fund-raiser at the McMichael Gallery for the Polar Artists Group, whose mission is to bring awareness to the challenges the Inuit are facing in adapting to climate change and the melting Arctic. I wasn’t intending to purchase anything — though I admired many of the paintings — but this beautiful Inuit doll caught my eye. I entered a bid in the Silent Auction, and to my surprise, ended up being the lucky winner. The doll was donated by ITK (Inuit Tapiriit Kanatami) whose President, Mary Simon, spoke at the event. 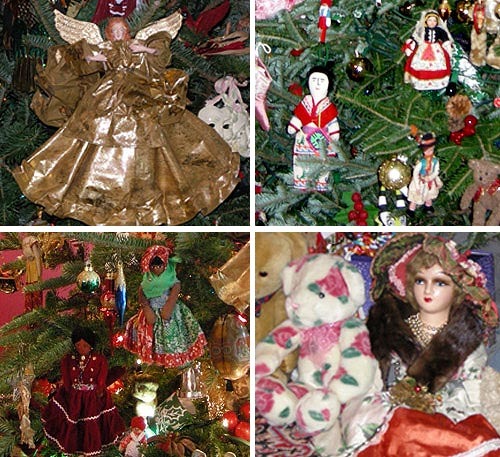 It seems fitting in so many ways… I’ve been collecting colorful dolls to decorate our Christmas tree for years now. We have Mexican, Spanish, French, English, even a North American Indian doll. But this is our first Inuit doll. Becoming its owner, made me curious to find out more about the doll’s history and tradition. Who made the doll and why? I called ITK to find out more, but was only told it was ‘rare’ and fairly old. But they couldn’t tell me who made it, or exactly where in Nunavut it came from. So, I turned to Google and unearthed some basic and quite fascinating history about Inuit dolls. Eva Strickler and Anaoyok Alookee in Inuit Dolls: Reminders of a Heritage write, “Dolls, originally toys for young girls, became sought-after collectors’ items for visitors to the North during the historic period of Inuit art. Fully clothed, they reflected the traditional clothing in any region and thus served perfectly as “models” and souvenirs for this particular aspect of Inuit material culture. While dolls for domestic use were artless, dolls made for barter could be quite elaborate and should be included in any discussion of historic Inuit art. “In the past, Inuit girls around the age of ten, used to make their own dolls with the help of an older sister or sister-in-law. Learning that young Inuit girls learned to sew by creating these dolls was a nice touchstone for me. I learned to sew as a child, and it was a skill that taught me many things about myself. Like the importance of doing things right the first time, and patience and perseverance when we do things wrong! I remember going to my mother with my bungled sewing projects. And she would very patiently explain how I’d sewn it upside down and backwards… and hand me the seam ripper. Somehow the pain of getting it right made the pleasure of a handmade object even more exquisite. 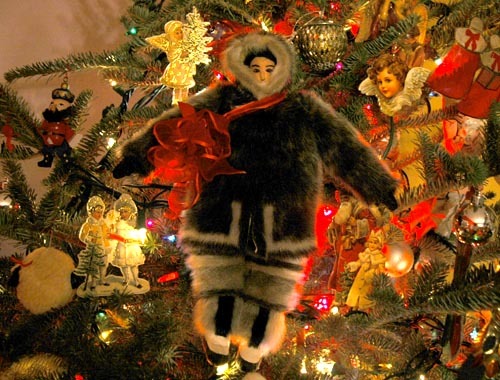 So, it’s wonderful to have this hand-made Inuit doll join our Christmas doll collection. In a way it brings the Canadian Arctic, and the Inuit culture a lot closer. And I think that’s what Mary Simon and ITK intended — that Canadians should become more aware of the Inuit of Canada. But the funny — or shocking thing is — that it’s only in deciding to write about this doll that I learned what the four regions are! They are, from West to East, the Inuvialut Settlement Region (Northwest Territories), Nunavut, Nunavik (northern Quebec) and Nunatsiavut (northern Labrador). Me and My Dog Team? We sold our only car in February of 2007. With mass transit and walking it has been easy to get around. But I can’t imagine if we lived in the north — where many regions have no roads… How we would get around if we sold the family car? Would I be willing to train and feed a team of dogs? Wow we have it easy here! Best wishes to you for a happy and healthy 2008. How wonderfully evocative, Franke, of so many memories. I visited the North (Baker Lake) in 1979, and I quite vividly remember the art (and the friendlness) of the people there. Why are the ravages of climate change affecting first the people and places least responsible? I, too, remember my mother helping me learn from my sewing mistakes. I can almost “see” way back to the earliest mothers teaching the earliest daughters how to sew clothing — and dolls! And Christmas trees! 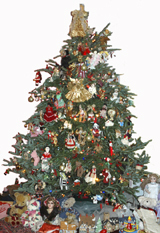 Each year, decorated lovingly with memories, they help us celebrate the turning of the seasons. Connecting with our family’s past with rituals and celebrations like this helps us think to their future — and the kind of legacy we want to leave behind. Thanks for sharing Franke. My daughter is 4 now and you’ve just given me a great sewing idea for our weekend craft project. I share Julie’s view – your article is thought provoking in many ways – I particularly appreciate the ways in which you seem able to take fairly typical events like a fundraiser and then work multiple tangents to provoke thinking and engagement. Cheers. The post on the Inuit doll is very touching… I knew about Inuit dolls but learned a few other details from your investigation that I did not know before. Thanks! Your article on the Inuit doll is very good. Thanks!